CONCEPTS A low deck is in essence part of your house – an extended living room. The materials you walk on, be they real wood or a synthetic pretending to be wood, comprise an elevated floor. Like houses, decks have a supporting structure underneath. And since decks are normally attached to your house (or appear to be), they really do extend your house outside. In concept, in material, and in reality. This outdoor room may have walls — rails — and it may have a ceiling overhead — a pergola. Its furniture may be outdoor tables and chairs or built-in benches made of decking materials. By contrast, a patio is part of your yard. It is made of “natural” materials: a compacted base of crushed stone; a layer of bedding sand; and a surface of natural or imitation stone. 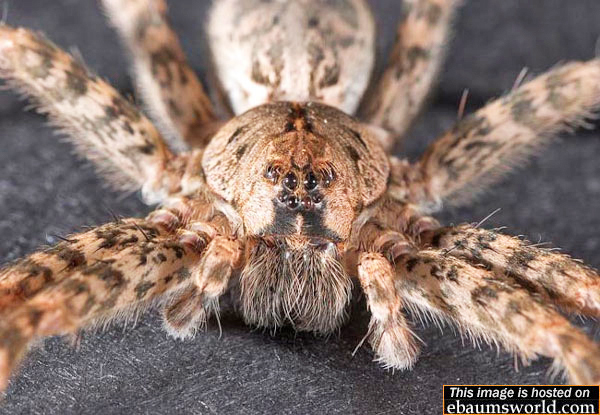 It has no structure underneath and is not attached to your house. Most often patios are set at grade level, and have no step down to the yard. Indeed, they are part of your yard, just made of hard stone rather than soft grass. That’s why they are called “hardscape”. Conceptually, these differences affect the atmosphere each creates and how people feel about them — and consequently how people use them. And beyond that, the differences between a patio and a deck have some very practical implications. LEGAL CONSIDERATIONS Cities and towns consider decks to be additions that require permits and inspections. They assess value to decks and tax them accordingly. ² Decks must meet town setback requirements (minimum distances from property lines) and are subject to federally mandated Wetlands Programs, as well as local Board of Health rules protecting septic systems. The Building Code, an extension of the law, considers decks to be structures and imposes significant, detailed requirements on their construction. Patios are exempt from all these rules. No permits, no inspections, no taxes, no setbacks, no construction rules. Nothing. Patios are just natural elements of your yard. HOWEVER (Here comes the fine print. Sorry. ), if your patio is near officially designated wetlands, the local Conservation Commission will take an interest. They are charged with protecting wetlands, and a patio’s construction and its impervious surface could change water flow and affect nearby wetlands. You should formally apply to the CC before building a patio near wetlands. Their interest level (read “interference level”) varies, but they will consider how disruptive the patio construction will be, how far it is from the edge of wetlands, and how the patio will affect rainwater runoff over the long term. Ironically, the impact of a patio on nearby wetlands is typically worse than that of a deck. DRAINAGE Deck flooring is spaced to allow water to drain through, so decks are almost always built level. Most patios, however, are not porous. Today even the joint sand is solid (to stop weeds), so patios must be sloped to prevent water from puddling. Consider this slope before you put a hot tub on your patio. An exception here is a patio made with permeable pavers. They let water drain through, and thus the patio can be built totally level. SURFACE The hard, stone surface of patios is a mixed blessing. It endures rougher treatment than wood or plastic decking (from metal snow shovels, heavy falling objects,…). Advantage: Patios. But patios fight back: they’ll shatter a dropped plate or skin your child’s knee. Decks are softer, so they’re kinder to visiting skin and may even ignore that dinner plate. And consider personal lifestyle: Your bare feet and your crawling baby will prefer a smooth deck. Advantage: Decks. 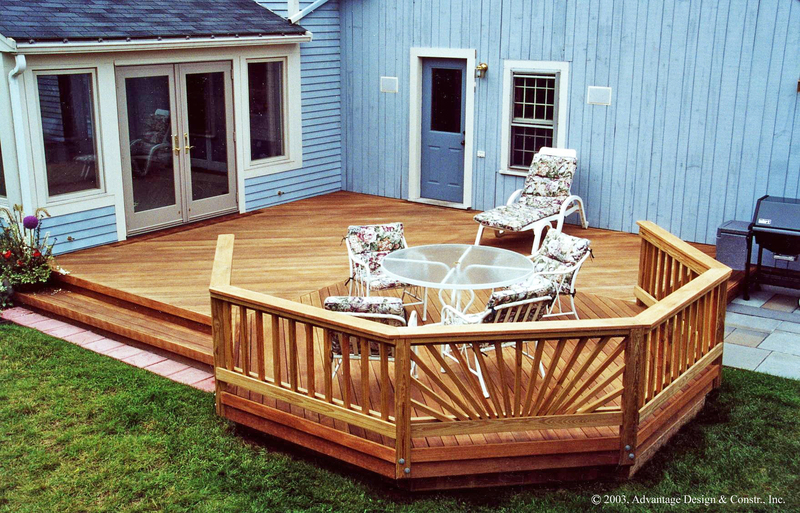 STAINS Newer, all plastic decking has some impressive guarantees against stains, especially food stains. 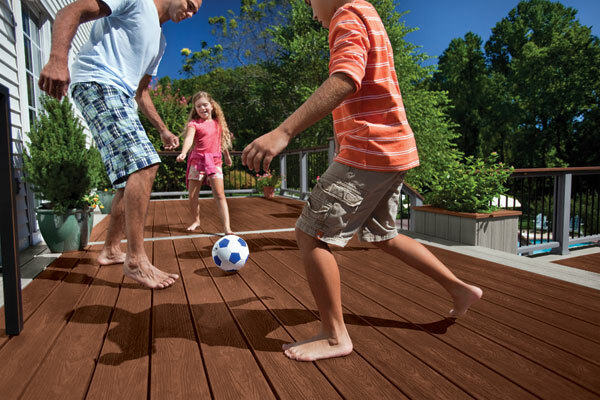 For example, Fiberon guarantees its Horizon decking against stains for 25 years. And the small print here isn’t bad: the warranty gives you a week to pick up that greasy burger. On the other hand, patios do not survive stains as well. 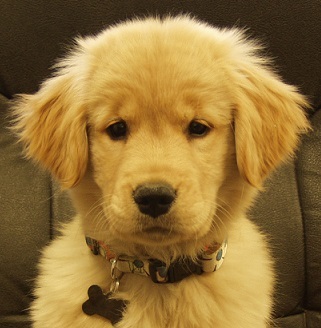 They are more vulnerable to both food stains and to “natural” stains – like acidic leaf stains. Even worse, patio pavers sometimes bring their own stain with them. Efflorescense and pyrite (rust) are natural deposits within pavers that can occasionally rise to the surface. Advantage: Plastic Decks. MAINTENANCE Patios require no periodic maintenance. Well, almost none. You’ll want to sweep leaves off and maybe hose off your patio once a year. Easy. The best synthetic decks (all PVC or plastic coated), like patios, require only the occasional hose or broom. See low maintenance decks. HYBRIDS and COMBINATIONS Still undecided? Well, you can mix categories. One of our clients requested a “wooden patio”. Really. So we built one: No structure underneath, no rail around it, just decking and joists on concrete blocks. At the other extreme, the floor of your deck could be stone. The best of both categories is a combination project with a deck and a patio: A flat, smooth deck brings you from the porch to the hot tub. And a patio of concrete pavers blends in to the rest of the yard. The best of both, literally. CONSTRUCTION Building a deck or patio is best left to professional deck or patio builders. 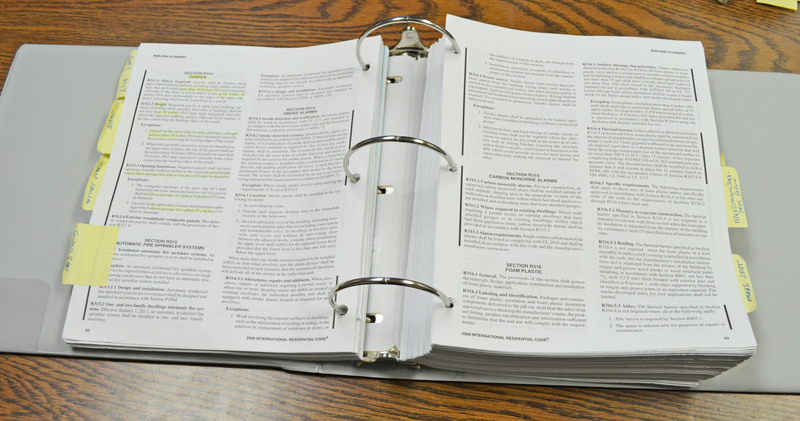 The rules governing deck construction are scattered within the Residential Building Code’s 850 pages, and those rules are growing in scope and complexity. The primary issue here is safety. When decks fail, people are injured or worse. Google “deck collapse” if you are skeptical. Even patios are not easy. 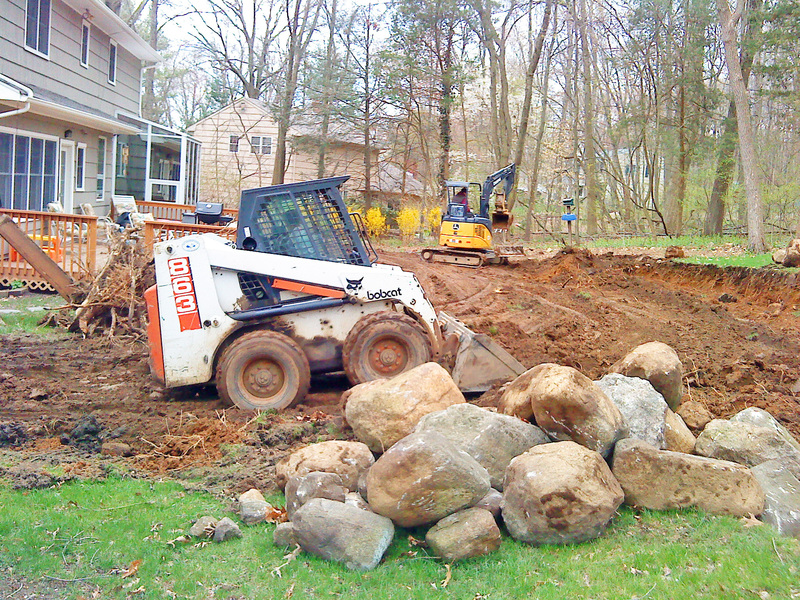 Construction begins with removing 8” to 10” of soil. You’ll then need to add base material in several layers, carefully compacting each layer. Next, step 3,…Time for machines! BUGS Flying bugs can attack anyone on a deck or patio. There is some evidence mosquitoes do not reach tall decks, but I wouldn’t bet my bare skin on it. 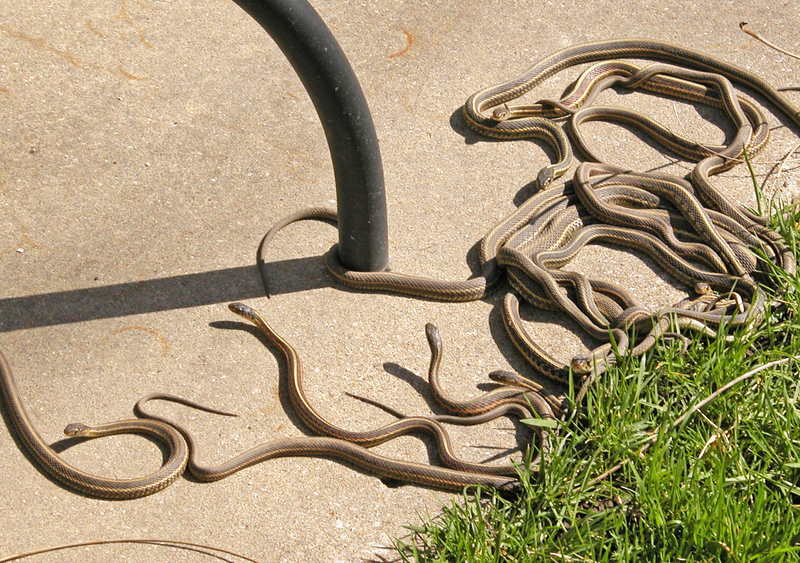 SNAKES I’ve never seen or heard of snakes on a deck. Stairs stop slithering. — or around your own leg. Don’t worry, they’re probably not poisonous. 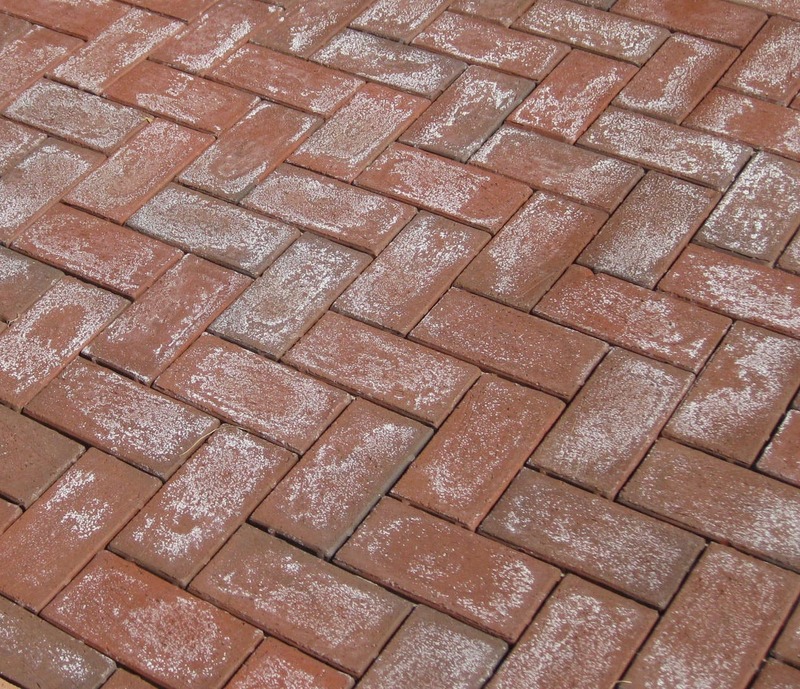 More on efflorescence on pavers. 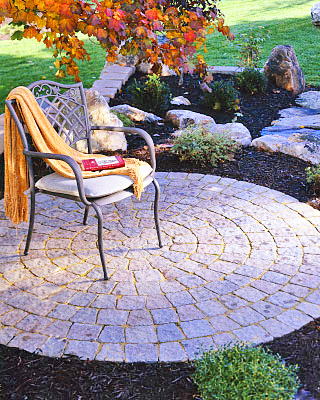 My discussion focuses on patios made of concrete pavers or natural stone. I ignore concrete slab patios. Good taste stretches only so far. Towns usually exempt small decks and do not permit, inspect or tax decks if they are smaller than 200 sf, less than a foot high, and not attached to a house. We at Archadeck of Suburban Boston offer professional design and build services for clients west and north of Boston. Over the past 21 years we have designed and built over 700 projects. We have enhanced the depth of our expertise by limiting our work to decks, porches, sunrooms, and patios. To view some of these projects, visit our website. To learn how we treat our clients, check our ratings on Angie’s List or read about us in an article in Remodeling magazine. For a free design consultation and a relaxed and rewarding experience, contact us via e-mail, subboston@archadeck.net or by phone, 781-273-3500. © 2013 Advantage Design & Constr., Inc.
What a fantastic, and thorough article in the difference between decks and patios! Wowzers! I am surprised to find so many great blogs on decks, home projects, etc that actually are not pitching products only! Another great blog I found was timbertownaustin.com/news/blog/ . Keep up the great articles!